Actor-producer Vishal Krishna Reddy, who has teamed up with filmmaker Suseenthiran for the second time in a yet-untitled Tamil actioner, says they have the responsibility of outperforming the success of their last film "Pandiya Naadu". The project was officially launched on Wednesday. "It is going to be a special film for everyone. This is my second project with 'Pandiya Nadu' team and we have lots of responsibilities to outperform our previous success. The same team from our last film has been retained and we have a new member - cinematographer Velraj joining us," Vishal said in a statement. Vishal plays an undercover policeman in the film, which also stars Kajal Aggarwal. 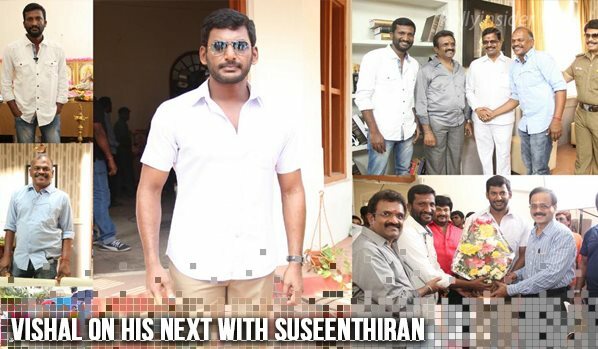 This is the third time Vishal will be donning khaki after films such as "Vedi" and "Satyam". The film, which will be produced by Vendhar Movies, also features Anand Raj and Murali Sharma in important roles.